Prior to any treatment, a dentist will assess the suitability of your teeth for whitening. During your first consultation appointment, you will have the opportunity to ask questions, discuss the shade of white you are trying to achieve, and receive advice on what is realistic for you to achieve and maintain. Impressions for custom-made whitening trays may also be taken for treatment and made for you to use our take-home kit. The gel is then activated using an LED light (please note, no UV lights are used as these may trigger cold sores). For maximum results, the process is repeated three to four times during your 60 minute session in the chair. When you have your treatment done at 7 Pearls Dental, the time will race by as you can choose to relax listening to music of your choice or catching up on your favourite Netflix program. After the treatment, you may opt to use a dental-grade take-home whitening kit (supplied with the In-chair whitening). How does home teeth whitening work? Either as an adjunct or an alternative to In-chair whitening, there is a convenience of the Take-Home Teeth Whitening kits. This usually involves a take-home kit that we provide, which includes a whitening solution and a custom-fitted tray to be worn over your teeth allowing the whitening solution to distribute more evenly. You will receive precise instructions on how to use this kit safely and for the best results. To use the kit, simply fill the tray with whitening solution, being careful to not over-fill, and place it over your teeth for as long as is recommended by your dentist. This is dependent on how much whitening is needed and a variety of other factors. Most people tend to reach their desired level of whiteness within two weeks, using the tray for between 30 minutes and on hour every day or two days. Here at 7 Pearls Dental, Dr Malesu will check that you’re a suitable candidate for teeth whitening during your consultation. We will also make sure you understand the possible side-effects, which can include teeth sensitivity for up to a few days following the treatment. You will receive detailed instructions from your dentist on how to use your take-home whitening kit safely, to avoid any problems. Using it incorrectly can cause permanent damage if the whitening solution comes into contact with your gums for an extended time. The Dental Board of Australia requires that whitening products with more than a 6% concentration of bleaching agents should only be used by a qualified dental practitioner. This is specifically why over-the-counter treatments have a reduced concentration levels compared to prescribed treatments. 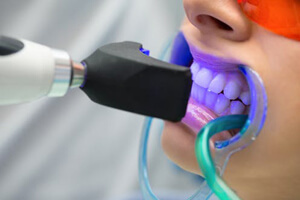 Gum health: When our experienced dentist apply bleach or whitening product to your teeth, you can rest assured that they are doing it professionally and the product will not affect your gums. As the higher bleach concentration, the greater the risk of gum irritation, it needs to be applied carefully and with the use of protective equipment to prevent damaging your gums. Teeth sensitivity: as mentioned before,, tooth sensitivity is a common side-effect of teeth whitening products which is why it is advisable to consult a dentist before a whitening product is applied. Our dentists check for tooth damage that may cause further sensitivity or discomfort during treatment, perhaps applying a high concentration of Fluoride a few days before treatment to reduce teeth sensitivity. What to do after your teeth whitening treatment? Even though you love your new smile and can’t wait to do it all over again, unfortunately, in the case of teeth whitening, there can be too much of a good thing. Good teeth whitening should last anywhere between 6-9 months (if not longer), so there’s no need to visit us for another session of whitening in that time. As a general rule, we recommend professional teeth whitening is completed no more frequently than once every 3 months- each time with a specific dental assessment to ensure the treatment is still suitable for you. You can touch up at home over 1-2 days following your in-chair treatment with a take-home whitening kit, but no further touching up is recommended. If you require any further information please do not hesitate to contact us at 7 Pearls Dental and speak to Dr Malesu to discuss a treatment that can be tailored just for you.